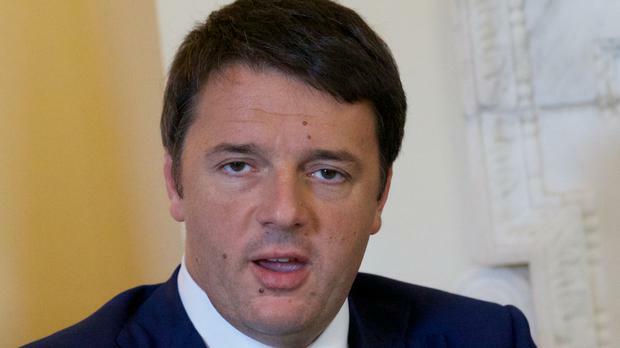 Italian premier Matteo Renzi has resigned, his self-inflicted penalty for staking his job on constitutional changes voters resoundingly rejected earlier in the week. Mr Renzi had first offered his resignation on Monday, shortly after voters rejected the constitutional reforms his centre-left government had championed. But President Sergio Mattarella, Italy's head of state, told him to stay in office until parliament completed approval of the 2017 national budget. A few hours after the budget was passed on Wednesday, Mr Renzi returned to the Quirinal presidential palace. This time, Mr Mattarella accepted the resignation of the man who in February 2014 became Italy's youngest premier aged just 39. A presidential palace official, Ugo Zampetti, told reporters that Mr Mattarella will begin consultations on a replacement on Thursday with the heads of parliament's two chambers, as well as with former president Giorgio Napolitano. Mr Mattarella will meet minor parties on Friday, and on Saturday plans to take proposals from the major players, including the Democratic Party that Mr Renzi leads and the populist 5-Star Movement. It could be clear who Mr Mattarella might tap to be the next premier once those meetings are complete. The talks are aimed at sounding out party leaders to determine the configuration of a new government that would have enough support in parliament to win both the required confirmation vote and to lead the country until elections are next held. Elections are scheduled for spring 2018, but Mr Renzi's humiliating defeat in the referendum will likely hasten that date considerably, possibly bringing a vote in spring 2017. Opposition parties, including the anti-euro 5-Star Movement, are pressing for the elections to be held soon. "We want to go to the ballot box soon," said Roberto Fico, a 5-Star politician. But Mr Fico, as have both other opposition leaders and leaders from Mr Renzi's Democrats, also cited the need for parliament to approve a new election law before the national contests are called. In a speech to a meeting of the Democratic Party leadership just before he resigned on Wednesday, Mr Renzi took responsibility for his political debacle. But, sounding a bullish note, he asserted his party would be ready for the elections whenever they are held. "We have no fear of anything or anybody, if the others want" elections soon, he said. Many Italian governments have collapsed far before the end of parliament's five-year term. Italian politicians have struggled for decades to devise an electoral system that would make the country more governable.